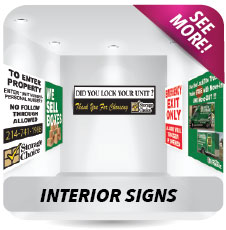 Signquick makes many types of signs for the Self Storage Industry. 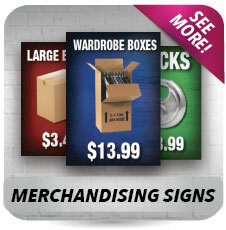 We can outfit your entire facility with nice attractive marketing signs. Also our interior and exterior signs are color coordinated to match. 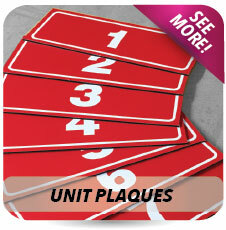 Self Storage Signs: We have several different types of self storage signs available. Interior and Exterior Signs along with yard signs. Self Storage Banners: With our Self Storage Banners we have 6 different styled themes with many different stock sayings. 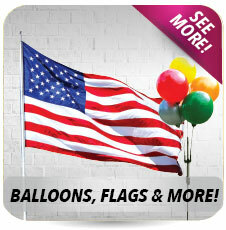 They are printed in full color on 13 oz matte vinyl and provided with nickel grommets. 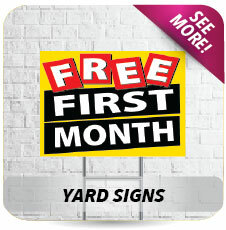 Self Storage Yard Signs: Our Self Storage Yard Signs are printed in full color on 4mm weather proof corrugated plastic. They are printed both sides and sized 18" x 24". They are easy to install using our economy wire stake or premium stake. 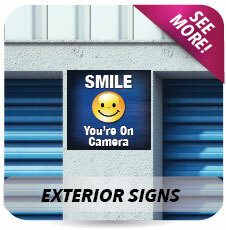 Self Storage Interior Signs: Our Self Storage Interior Signs are printed in full color on 3mm PVC. PVC is a smooth surface and creates a rich appearance. Self Storage Exterior Signs: Our Self Storage Exterior Signs are printed in full color on 3mm aluminum composite material. Signs will not rust and the best material used for outdoor applications. 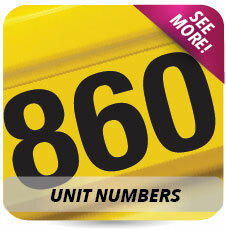 Self Storage Unit Numbers: Our Self Storage Unit Numbers are furnished in two styles. One is ready to apply vinyl lettering which is pre-spaced and ready to apply. Long-life vinyl is used. The other item we use is 3" x 7" aluminum composite panels which can be attached the building. Self Storage Rules Signs: Our Self Storage Rules Signs are printed on either aluminum composite or .080 aluminum material. 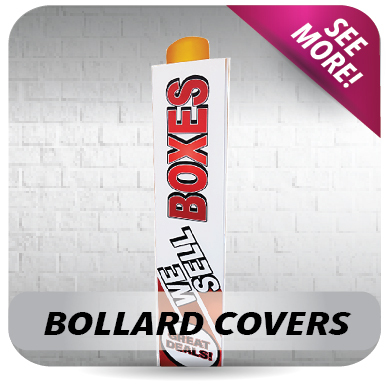 Depending on size, they are furnished with holes for easy installation to aluminum poles. In addition to stock items we specialize in custom printed items. We can create an entire sign package for your self storage facility which can incorporate a new logo and color scheme. Please call customer service for a quote.